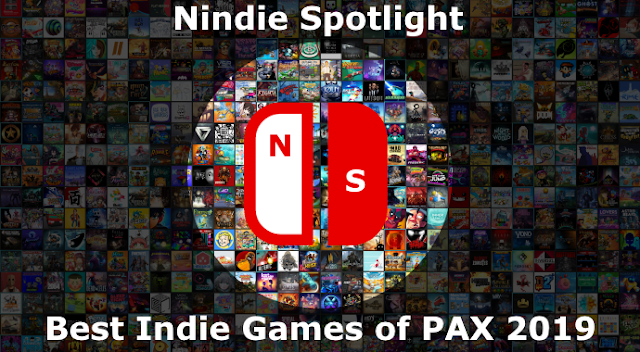 Nindie Spotlight: Editorial: Support Your (N)indies! Writing this is a bit odd since I'm convinced that the vast majority of people who will read it will be the already converted. I'd imagine the next most likely people to read it would be those who are determined to dismiss it immediately, reading primarily for the purpose of scoffing at it to then go back to playing their AAA games. The audience I'm really hoping to reach, and share my thoughts with, are the people without a current dog in this fight who are at least curious about the independent game development community. While obviously, just like anywhere else in the market, there are games ranging from incredible to terrible coming from indie developers there are a number of things that make them very appealing to support. First, and possibly most important of all, is that every indie developer I've interacted with or talked to at some point has been extremely passionate about what they're doing. This in no way is meant to besmirch people working for large publishers, I'm sure many of them are passionate as well. What is different with indies, to me, is that with far smaller teams (many in single digits) and budgets the passion these folks have for their games is very present on the screen and in what you play. This isn't focus-group-driven, design-by-committee gaming, what you're playing is a much more raw connection to the content creators and in many cases you can feel that love coming through in the product. Another way this passion often manifests itself is in the open enthusiasm many indie developers have for the work of others in the industry. They love games, including ones from their "competitors", and will not just praise them but will often openly advocate for them or help push other people towards them. That unbridled enthusiasm is terrific to see and shows a sort of heart I can't help but admire. Second is the fact that independent game studios are absolutely helping, if not transforming, the market. They're making compelling content that is generally focused on new ideas and more daring expressions of creativity... and typically at a much lower price as well. They're not churning out the same product year-over-year with a few new features for the same well-established premium "going price", they're mixing and matching different genres, sharing new ideas that you've never seen before, and doing it for what is often less than even half the price of the larger companies. The fact is for the price of one AAA game you could likely buy at least 3 or (in some cases many) more indie games. Independently-developed games as a whole represent choice and innovation, and they're beginning to really come into their own with some well-established indies, who already have a strong track record, insisting on staying small to remain true to their spirit. Third is a more of a thought of mine than something I've confirmed, but I see the independent game community as being full of people who didn't simply bemoan the lack of innovation or creativity in the more traditional games market, they've decided to actually do something about it. As in all business ventures success can be incredibly elusive and many of these people are putting it all on the line in the hopes of making a splash, and sadly the likelihood is that for any number of factors many will continue to struggle or fail regardless of the quality of their product. The indie devs are fighting for attention against the likes of Nintendo and other massive publishers who have their legacy, IPs, the ear of the game press, and massive budgets for marketing. Without being able to buy attention social media has become the point of attack of choice for many, but with so many established channels out there even this has its challenges just to get your eyes on their product in the first place, let alone compelling you to buy it. There was a time when development studios you hadn't heard of more rightly demanded a degree of skepticism but we're right in the middle of an indie renaissance right now, and new names typically are bringing very worthwhile content to the table. Fourth is that is important for everyone to dip a toe in ponds outside of their comfort zone once in a while, it may help you discover there's an entire world of games out there you've been missing out on. One specific game type I'll touch on here (and will likely write an editorial about later as well) is the "rogue-like". Somewhat oddly I wouldn't describe rogue-likes as a genre, type is probably the best descriptor I have for them. They hinge on some degree of randomness in their DNA and I've seen 3 incredibly distinct rogue-likes already on the Nintendo Switch, all of which I've enjoyed greatly (for reference they're The Binding Of Isaac: Afterbirth + [a shooter of sorts with all of its glorious weirdness], Has-Been Heroes [a lane-based strategy game that too many people dismissed because of its challenge, difficulty is the wrong word], and Tumbleseed [I'm not sure there's really a genre for it, it's just unique and awesome... true Indie spirit!]). Up until about 2 years ago I'd never heard of rogue-likes or at least not really taken them seriously and then I stumbled onto both Isaac and Rogue Legacy on the PC and I was hooked. I know some other people who were also hesitant about trying rogue-likes and, for the most part, the ones who have decided to give them a try are now fans. Obviously there are far more types of games independent developers work in, I just think the diversity and challenge of the rogue-likes, as a specific type of game, probably wouldn't have happened the same way with more traditional publishers. Fifth, and I've held off on this one since I first wanted to establish the value of unknown developers out there, is that many of these indie studios are either being lead by or empowered by people who were vital to the success of big games you already love. These, again, are generally people who decided that the major studios aren't doing it right, or aren't willing to take the chances they would like to see, or are simply grinding them into the ground so they decided to go to a smaller scale for success. It's no coincidence that there are new retro games popping up that seem to have roots in common with established standbys or even game franchises people had given up on as dead. In many cases people with strong ties to those same games have struck out into the indie space in order to find their new successes. There are certainly more high-profile people who have started their own studious to much fanfare but you also have designers, programmers, and other specialists who can bring along some of that spirit with them as well. Sixth, and this is where I finally can't help but get out my Nintendo fanboy hat, I think that the current and future success of the Nintendo Switch can and should be as much driven by the Nindies releasing terrific games week after week as by the major tentpole first-party games Nintendo is deservedly well-known for. To date the Switch has had an absolute embarrassment of great gaming riches, and I have yet to be disappointed by anything I've bought for the system (Super Bomberman R, by price, I'm not thrilled with but will give them credit for patching it to improve). During the slower/darker life of the Wii U, because of the practical limitations of the tablet, I developed my strong love for indie gaming back on my PC. The fact that I now own a platform that enables me to play those games on my TV, at my desk, or on the go is a revelation, and I hope the great strengths of the platform brings success both to Nintendo and the Nindies that release games for it. Due to their scope and style most indie games work wonderfully when I'm on the go, and with the Switch all I can think of or hope when a new title is announced is that it will make its way there so I can enjoy it at any time and in any place I may choose. It is liberating! As I close this out I'll openly acknowledge that I'm still probably not even covering all of the things that make support for the independent development community important to gaming as a whole. If you'd like to leave comments (whether as a fan or a developer) please feel free to do so and perhaps we'll have a sequel or follow-up of sorts if it is warranted. For myself, in the spirit of people deciding to do something when they don't see enough being done, I not only decided to write this editorial but am also working to become a more direct advocate by starting up @NindieSpotlight on Twitter and YouTube where I'll try to do whatever I can to help advance the Nindie cause specifically. The Switch is off to a tremendous start, and I personally view the Nindies as being a key piece of that success. If people will learn that it is OK to sometimes let go of the need for physical releases and to pop in what is usually the cost of a movie or going out to eat, to take a chance on something new, I see a future where everyone can win and we'll continue to grow a much more diverse and vibrant gaming community. Editorial: Why Do You Write Reviews?